The addition of a robo-advisor platform with a strong emphasis on retirement savings is a natural evolution for a major financial concern like TIAA. The company’s name is practically synonymous with retirement plans, and they offer all types. TIAA Personal Portfolio Robo Advisor can be used for taxable investing, as well as retirement. 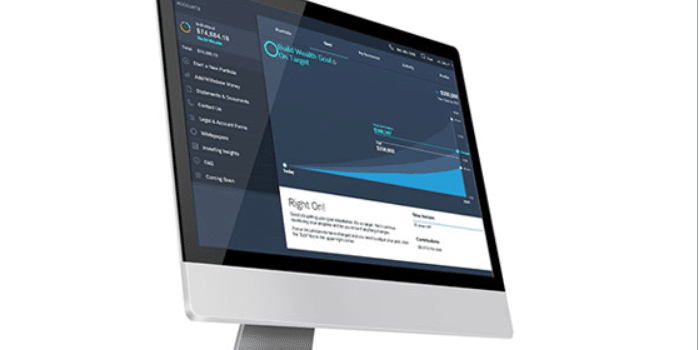 But their goal-based investment planning makes this robo-advisor particularly user-friendly. They offer three different portfolio options, including a socially responsible investment choice. Since TIAA has been engaged in this type of investing all the way back to 1990, you can bet the socially responsible investment option will be one of the best among robo-advisors. And making the package even better, opening an account with TIAA Personal Portfolio gives you access to the many other financial services offered by the TIAA family. 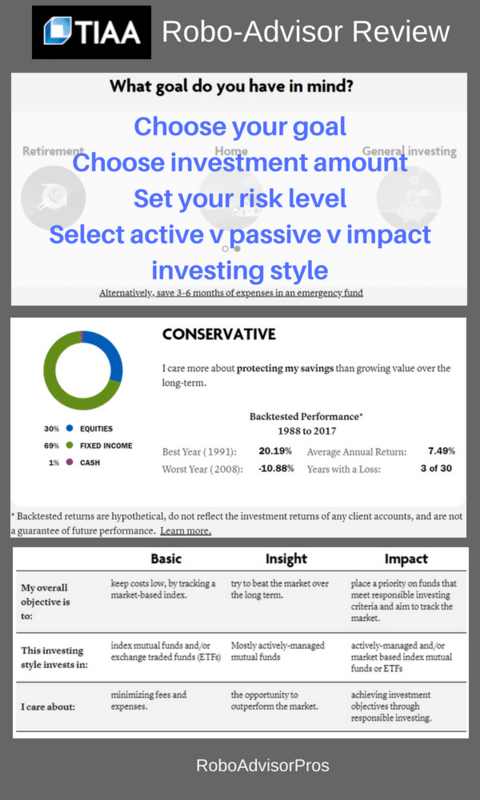 Overview Automated investment management robo-advisor platform. Top Features Robo-advisor with passive and active management portfolios. Can opt out of a fund if you don’t want to invest in it. Access to wide ranging financial services at TIAA. Contact & Investing Advice Available by phone Monday - Friday from 8:00 am to 7:00 pm EST. There are more than 70 experienced consultants available to help with account-related and financial questions. Investment Funds Diversified mutual funds and exchange traded funds, offered primarily by Nuveen Investments, Inc., iShares, and other TIAA affiliated funds. In addition to having your money professionally managed at a low annual fee that’s well below that of traditional money managers, TIAA Professional Portfolio offers a portfolio option that invests in socially responsible companies. This is a growing trend throughout the investment industry. But TIAA has been offering impact investing funds longer than most of its competitors. Personal Portfolio also benefits from being part of the TIAA family. TIAA is one of the largest financial institutions in the country, serving more than 5 million active members, with more than $1 trillion under assets. Banking – includes high interest checking and savings accounts, money markets, CDs, and home financing. Investing – in addition to Professional Portfolio, they also offer retirement plans and annuities, brokerage and trading, 529 education savings, and various managed investment accounts. As one of the world’s largest financial institutions, TIAA is virtually a one-stop shop for all your financial needs. 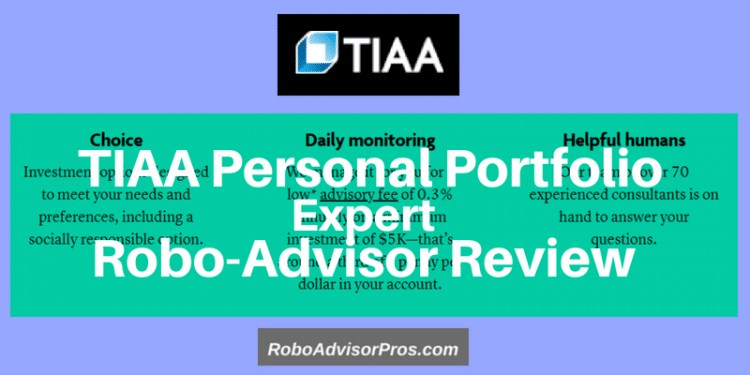 Who Benefits from the TIAA Personal Portfolio Robo-Advisor? If you’re looking to invest your money, but have no experience or desire to do so yourself, TIAA Personal Portfolio is an excellent low-cost platform, with a 0.30% fee. You can have a $20,000 portfolio managed for just $60 per year. That will include portfolio selection, rebalancing, and portfolio adjustments as necessary. All you’ll need to do is fund your account. It’s also an excellent platform if you’re interested in socially responsible investing, and a growing number of investors are. TIAA Personal Portfolio has a portfolio option dedicated to just that. TIAA Personal Portfolio is also an excellent choice if you’re looking to take advantage of other financial opportunities within the same institution. For example, you can do your banking and purchase life insurance – and even get home financing – through the same company you invest your money with. This portfolio option involves passive investing, which is typical of the majority of robo-advisors. The fund works to track the market, rather than attempting to outperform it through active investment management. This option is composed of index funds, which have lower turnover ratios and lower expenses than their actively traded mutual fund cousins. Index fund investing typically outperforms actively managed portfolios. This option is the opposite of Basic. It uses active investment management, as investment managers select funds in an attempt to outperform the general market over the long term. Because they’re actively managed funds, they contain higher fund expenses than index funds. This is TIAA’s actively managed socially responsible portfolio. The Impact portfolio targets two goals; investing in funds that meet socially responsible investment criteria and also track the market. This is consistent with TIAA’s long history – going back to 1990 – of offering socially responsible funds. This option attempts to select investments based on environmental, social and governance related criteria. It excludes investing in companies that investors might consider objectionable. But more specifically, it seeks to invest in companies that provide long-term value creation, while delivering economic, social and environmental sustainability. It has a dual objective of “doing good, and performing well”. TIAA Personal Portfolio uses primarily “affiliated funds” in the construction of individual portfolios. Affiliated funds typically represent 90% or more of a portfolio. Affiliated funds are comprised of the TIAA family of mutual funds, and funds managed by Nuveen Investments, Inc., and will consist of both mutual funds and ETF’s. Although, the index ETFs include iShares funds. Your portfolio can be constructed with all or any subset of these funds. TIAA has a very long list of mutual fund offerings, and you can view that list here. You can view the list of mutual funds provided by Nuveen to see what funds may be included in your portfolio. The specific fund management fees are typically greater for actively managed funds than for vanilla index funds. In general, the fund choices are broad and include typical stock and bond funds along with growth and value stock ETFs. The TIAA offerings include a variety of bond funds, real estate and socially conscious funds. Some of the funds are passively managed index funds while others are actively managed and try to outperform the indexes, as mentioned in the Insight portfolio section. Automatic Rebalancing. Your Personal Portfolio is monitored daily. Your portfolio will be rebalanced as a result of changes in market conditions, or deposits and withdrawals to and from your account. Rebalancing will ensure that the allocation stays within the target model portfolio. Rebalancing tempers typical investment value ups and downs. Clearing agency. TIAA Personal Portfolio uses Pershing, LLC as the program custodian. Independent clearing agencies add another layer of security to your investments. Pershing is one of the largest such agencies in the world. Account protection. Uninvested cash, held in an interest-bearing TIAA Bank Sweep account, is FDIC insured for up to $250,000 per depositor. There is also protection provided by the Securities Investor Protection Corporation (SIPC) against broker failure for up to $500,000 in cash and securities, including up to $250,000 in cash. However, be aware that the SIPC does not protect against losses due to fluctuations in the market value of your investment positions. Quarterly Check-in. TIAA checks in with you on a quarterly basis to determine if there have been changes to your life or finances that would merit a change in your investment profile. The check in gives you a chance to revisit your investment allocations and make any changes. You are welcome to contact TIAA and speak with any of the 70 financial consultants to discuss your investments or make changes, at any time. Participation revocation. TIAA can revoke your account if the balance falls below $5,000 due to your withdrawals, or if it’s determined that the program is no longer appropriate for you. Fees. The advisory 0.30% fee is levied as a percent of your total assets under management, and is charged quarterly in arrears. There are no trading fees charged for buying and selling asset positions. There are additional management expense ratio fees charged by the funds in your portfolio. These aren’t direct charges to your account, but rather charged within each individual fund. They also include 12b-1 fees. As is usually the case with robo-advisors, your portfolio or mix of investments is based on three factors: your financial goals, your time horizon, and your risk tolerance. Set Goal. The goal can be retirement, home, general investing, celebration, travel, or start a business. There’s also the option to save up for an emergency fund. You choose one, then move to the next screen. There, you’re asked to set a goal dollar amount, a time frame, your initial investment, and your monthly contribution. Build Portfolio. This is where your portfolio allocations are determined. If you’re not sure which category you fall under, take a brief questionnaire to help you choose your risk level. Conservative portfolios hold greater amounts of bond funds and lesser amounts of riskier stock investments. Conversely, as you move up in risk comfort, your investments reflect increasing stock fund allocations and decreasing bonds. A projected future value is presented, indicating the likelihood of your achieving that investment goal, based on your time horizon, initial investment, and monthly program contributions. Open Account. Here you’ll be asked to provide the routing number for your source bank account, your address, income and net worth, date of birth, and employment information. Once your account is up and running, it must be funded with a minimum of $5,000. This can be done either by mailing a check to TIAA Brokerage Services along with a deposit slip, or by linking your bank account to your Personal Portfolio. Please note that third-party checks are not accepted, nor are cashier’s checks for less than $10,000. Account withdrawals. You can make withdrawals by selecting the “Transfer Money” option. If securities need to be sold to complete the withdrawal, the funds will take between five and seven business days to arrive at the destination account. You can also request a withdrawal check mailed to your home. There is an important restriction on withdrawals. A withdrawal cannot cause your account balance to go below $4,500. If it does, it might trigger the participation revocation discussed earlier. TIAA Personal Portfolio is a solid robo-advisor for socially responsible or impact investing. The availability of additional financial services from TIAA offers a one stop shop for financial matters. Although, this is not unique to TIAA and is also available at Schwab, Fidelity, Charles Schwab, Ally and more. Access to 70 live financial consultants during week-days make customer service a breeze. No tax-loss harvesting is available. The fee structure of 0.30% is a bit high among comparable robo-advisors. Betterment and Wealthfront charge just 0.25%, with Wealthfront managing the first $10,000 for free. Among competing large broker robo-advisors, Charles Schwab Intelligent Portfolios has no management fee at all. The mutual and exchange traded funds’ charge higher expense ratio fees than those of most competition. When these charges are added to the 0.30% robo-advisory fee, this fund is more expensive than most comparable platforms. If you’re primarily interested in socially responsible investing, TIAA Personal Portfolio is a viable robo-advisor. They’ve been doing impact investing for longer than just about anyone. And if you’re interested in adding banking services, life insurance, annuities, retirement planning or home financing through the same company, TIAA can do it all. In all, the TIAA robo-advisor is a bit more expensive than competitors, due to higher underlying fund management fees and the 0.30% TIAA Personal Portfolio management charge. For more information, or if you’d like to open up an account, visit the TIAA Personal Portfolio website. Robo-Advisor vs Target Date Fund - What's the Difference?